Litecoin price after a major decline found support above $135 against the US Dollar. 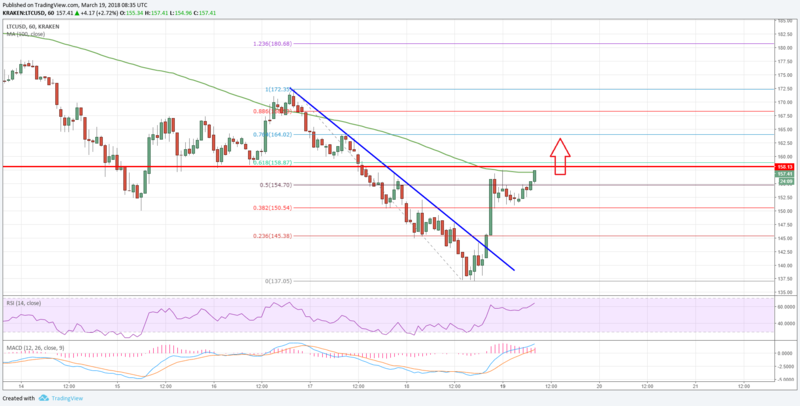 LTC/USD is correcting higher sharply and is currently above $150. Litecoin price is moving higher nicely after dropping below the $140 level (Data feed of Kraken) against the US Dollar. There was a break above a major bearish trend line with resistance at $141 on the hourly chart of the LTC/USD pair. The pair has to break the $158 and $160 resistance levels to continue moving higher. There were nasty declines this past week from well above $175 in litecoin price against the US dollar. The LTC/USD pair tumbled and traded below a few important support levels such as $160 and $150. The downside move was aggressive as the price even traded below the $140 level. A low was formed near $137.05 from where the price started an upside correction. It moved higher and broke the 38.2% Fib retracement level of the last drop from the $172 high to $137 low.